It seems like a bit of a given that shopping in bulk will help reduce your plastic waste, but it always sounds easier than it is, doesn’t it? It’s been about 8 months since I got my GreenUp box filled with all my eco-friendly grocery essentials. Yet, I only recently started buying in bulk – and I’m barely even succeeding in that. I mean hey, at least I finally bought my jars so I can now buy more food without plastic. The truth is, it’s been hard to start buying waste free. It took me forever to buy some simple jars, and now it’s taking me forever to remember to use said jars. And the jars aren’t the only thing I’m struggling with. Almost a year later and I literally just went shopping today without a reusable bag or any reusable jars or produce bags. But I want to get better and I want you all to get better also! So here’s a few things we should all start implementing in our lives as we shop waste-free. So let’s just start with the basics: what container should you use? Honestly, I spent way too long trying to find the perfect container to buy my bulk goods in. But the truth is, it doesn’t matter what they look like, they just need to be practical and airtight. (I mean clearly I didn’t care too much about the aesthetics of my jars, as you can see in these pictures). I was obsessed with those Pinterest photos of really aesthetic kitchen spreads with glass jars, but if your jars aren’t cute that’s totally okay, just hide them away in the cupboard like I did. The most important part is weighing your jars so you can have a speedy check-out. I weighed mine on my kitchen scale and wrote the tare weight in both grams and pounds on the lid. If you don’t have a scale, the cashier at your local grocery store would be happy to do it for you before you start shopping. The best part is that you only have to do it once! 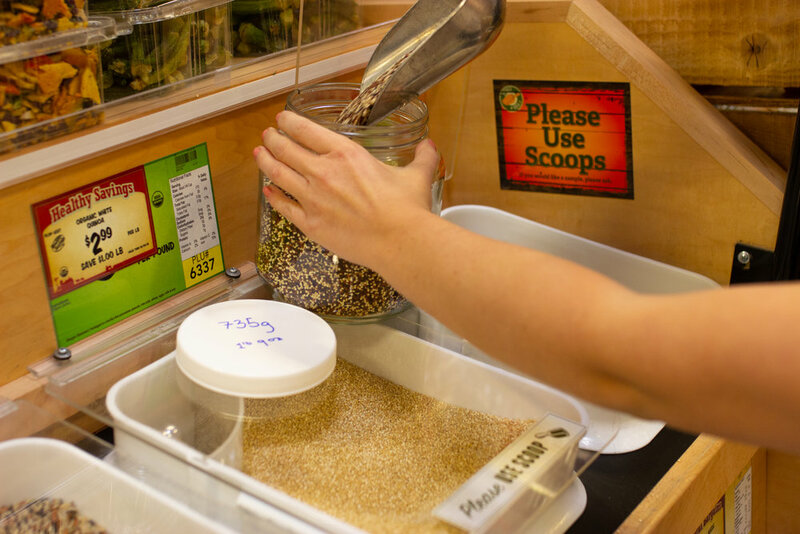 When you’re gathering your bulk goods, you’ll need to write down an item number so the cashier knows what to ring you up for. I bring a chalk marker with me to write straight onto the jar, this way I can wash it off and write new numbers each time and I don’t create any waste by writing it on paper. I’ve definitely talked about the importance of reusable bags before, but let me remind you of a few things. Plastic (and paper) bags are only used for ~maybe~ 30 minutes before they get thrown away. But those bags last long after any of us will (wow okay that was a little morbid – but true, nonetheless), so are they really THAT necessary? If you think about how often you shop and how many produce and grocery bags you use, it’s a ton of plastic we throw away every single week. Plus, plastic can be bad for your body, so it’s not necessarily the best to store fruits and veggies in those plastic produce bags. It’s better for you and the earth if you take a few minutes to remember to bring your produce bags and shopping bags with you on your next grocery run. Shopping plastic free is great – but what’s the use if the snacks you buy just go straight into small plastic bags so you can take them with you on the go? There’s tons of great options to help you reduce your use of ziploc bags! One of the easiest and fastest ways is to use small Tupperware containers or mason jars. But if you’re more into the bag idea then try gogoBags or (re)zip. I use my gogoBag (from my GreenUP box) super often to bring snacks with me to class and I get tons of compliments on it! Planning your shopping trips is essential to reducing your waste. Usually, I’ll go shopping when I’m already out running errands and I just happen to think about my grocery list. But when I do that then I go shopping without any of my zero-waste items. 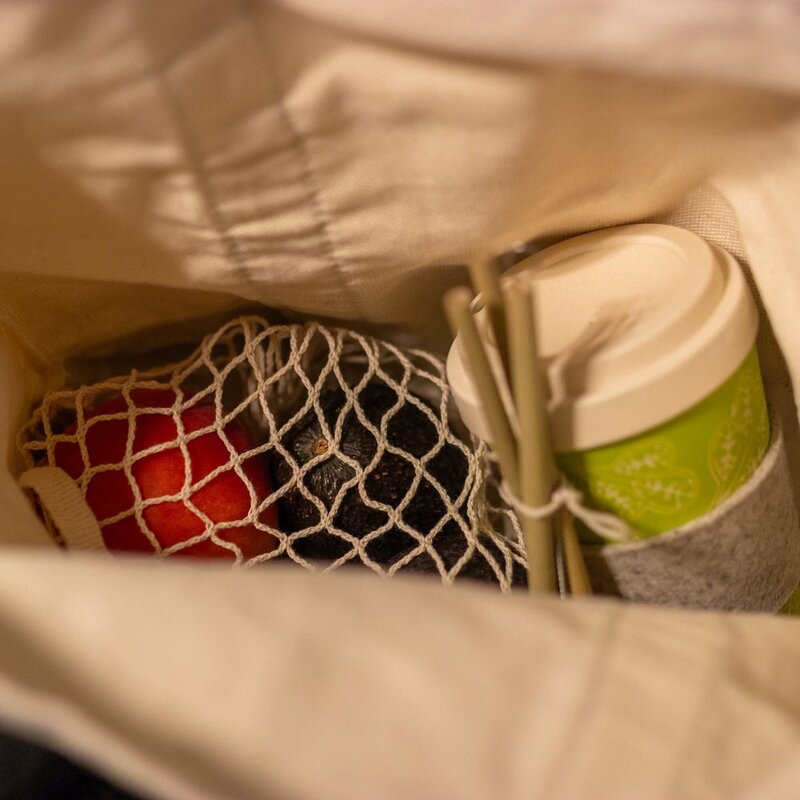 It doesn’t matter if you have everything you need to to shop completely waste free if you don’t ever actually bring those things to the store with you. Planning has helped me reduce my waste so often in the past. If I know I’m going to be shopping every Tuesday then I can plan for that in the morning and bring everything I need with me. It will take some getting used to but schedules are always a nice addition to your life, so I would definitely suggest adding this to yours. That was a lot of information, and probably a lot of information you already knew, but I think we all need a reminder every once in a while (myself included). 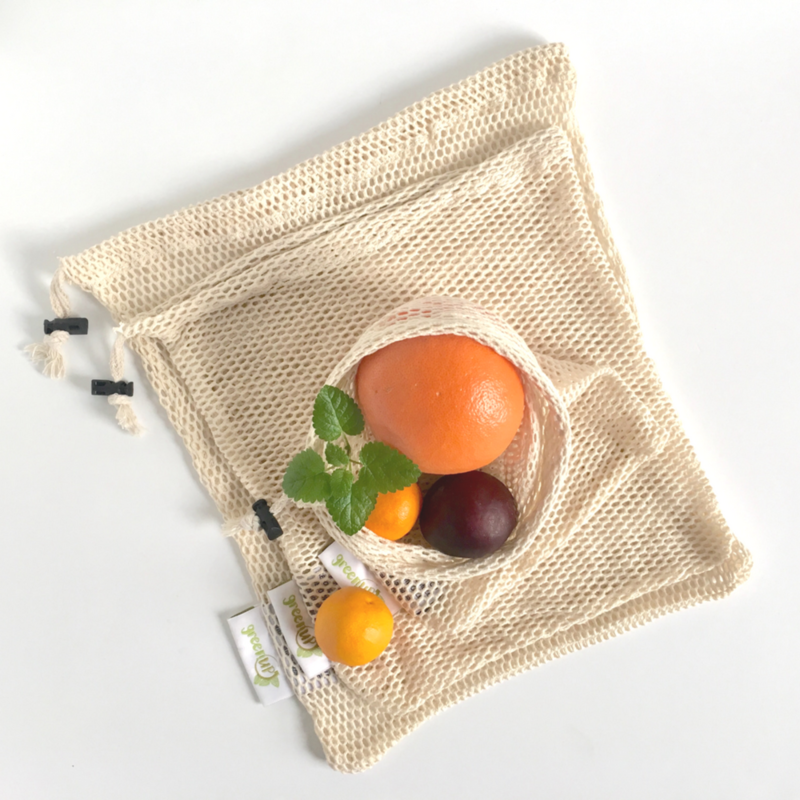 Shopping waste free can be a really daunting task and it can be very difficult to implement into your life, but it’s one way in which we can significantly reduce the waste we create in our day-to-day lives. How do you reduce plastic while shopping? I’d love to hear your advice as well!